Cruising once more as we did when I first arrived here in 2011, we've made decent time from a pleasant spot near Yardley Gobion. While sitting at our dinette we were passed by Tony and Helen on NB Holderness and were so besotted by the heat we didn't realize who they were until they had passed us! Sorry and hello! 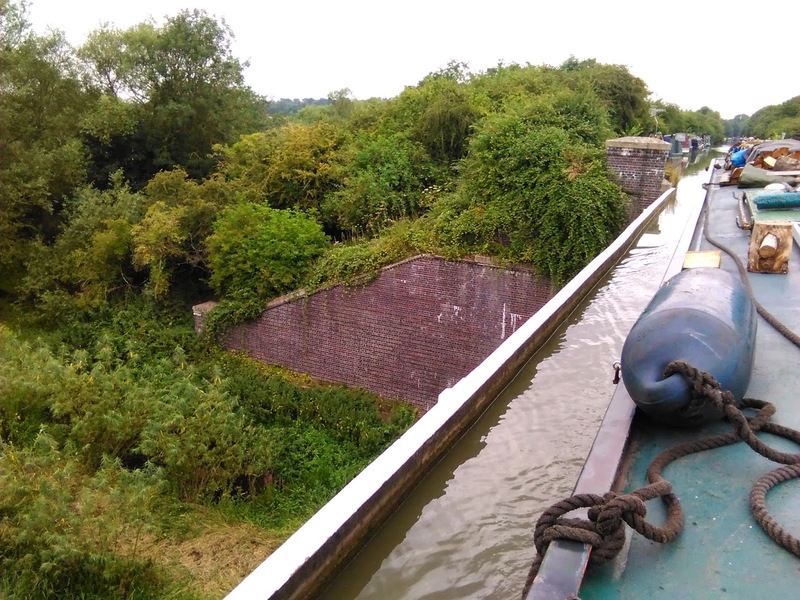 Les and I stopped in the pound of the second lock at Stoke Bruerne for a Tesco delivery and went on up through Blisworth tunnel. I steered NB Valerie all the way through the 3076 yards of dark, dank underground, passing four boats coming in the opposite direction. After one night moored up just before Station Road bridge we upped sticks again as there were signs posted from beyond there all the way back to Blisworth High Street indicating mooring along that stretch of the canal was restricted to traders and officials attending the Blisworth Canal Festival. 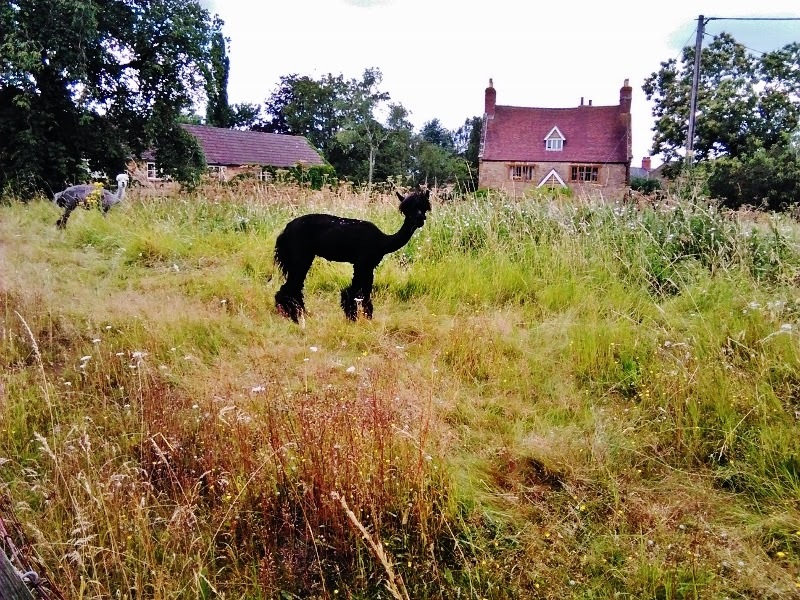 Although the Festival is the weekend of August 9th and 10th, the spaces along the canal from Blisworth clear to the Walnut Tree Inn were reserved beginning July 27th! So we left the next morning, stopping at Gayton Junction for H2O and rubbish disposal, after which we cruised northward until a relatively quiet spot appeared just after Bridge 45, adjacent to a horse farm, with only one other boat moored way off at the other end of the section near bridge 44. It didn't take long for four other boats to join us--the final one mooring closer to us than was necessary in my opinion. There was at least two and half boat lengths (57 ft average) behind them yet they chose to moor less than half a boat length in front if us and soon our quiet was shattered by the woman on the boat in front of us whose loud braying laughter and continual squawking commentary pierced our solitude frequently. The sun was relentless, beating down on NB Val, making us swelter. Still, I washed two loads of clothes and Les hung them to dry on the airer out on the grassy verge. I baked another loaf of bread and whipped up some fruit smoothies for lunch. Then I took a nap while Les foraged online for some info on car hires in the area. Dinner was grilled hot dogs and potato salad, after which we sat and read. I just finished the brilliant book Born to Run: A Hidden Tribe, Super Athletes and the Greatest Race the World Has Never Seen by Christopher McDougall. When we could keep our eyes open no longer, we made our way to bed in the quiet dark, happy and sleepy. The gloaming--my favorite time of the day. Looking back down the lane toward the bridge. 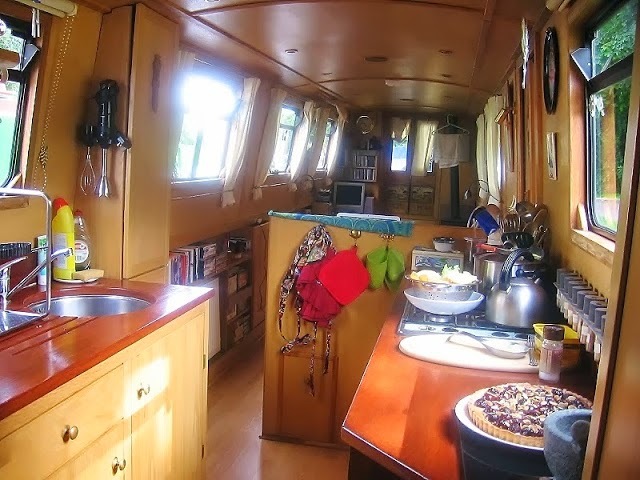 After an early breakfast on the veranda of muesli (me) and granola (Les) with fresh strawberries and coffee, Les realized all the other boats had moved on and we had the entire stretch to ourselves! With joy we dressed and manually moved the boat closer to bridge 44, mooring the bow under the shade of an oak tree. 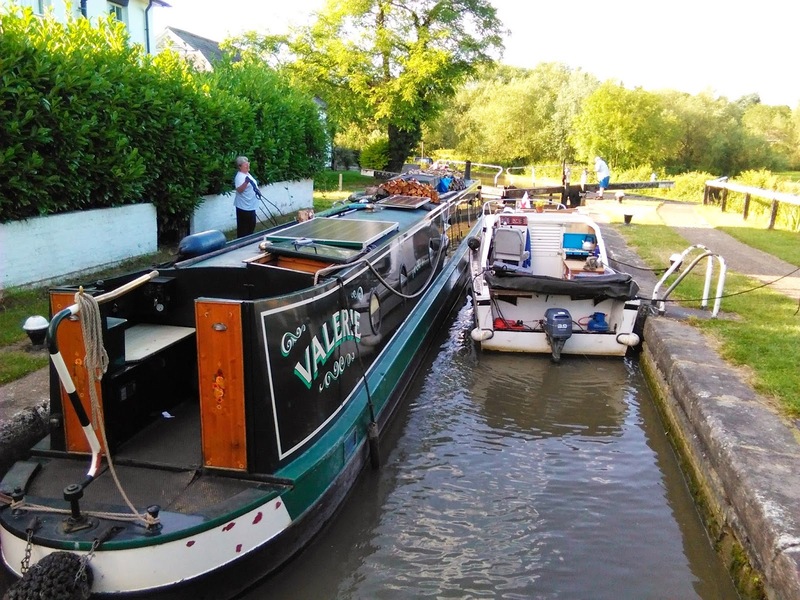 We grabbed our hats and sauntered up the towpath, over bridge 45 and up the lane to the village of Gayton which sits on a hill 135 meters above sea level opening out to a shallow valley in which sat our boat on the Grand Union canal. We took in the view as we climbed until we reached the village church, St. Mary's. 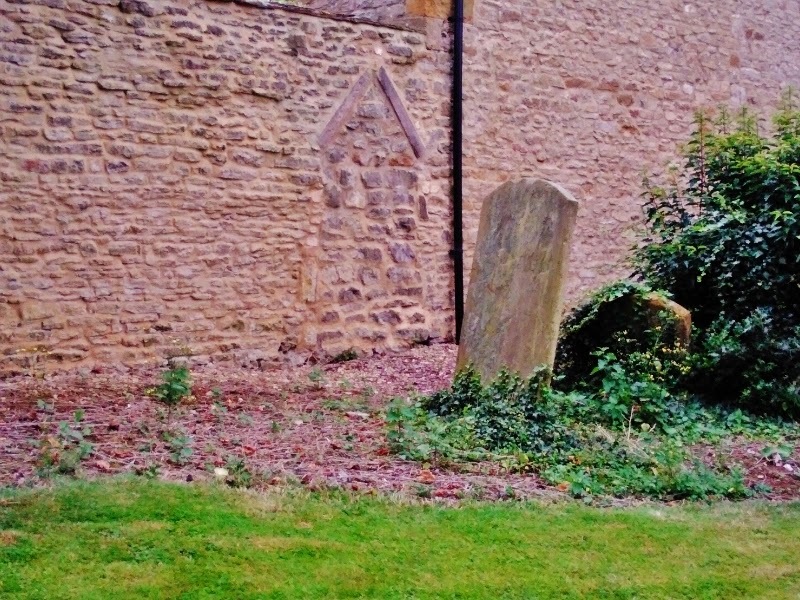 It was locked tight but we wandered through the churchyard, thinking about its eternal inhabitants, enjoying the architecture (parts of it date from 1209), settling on a bench to sip water from the stainless steel bottle I brought along. 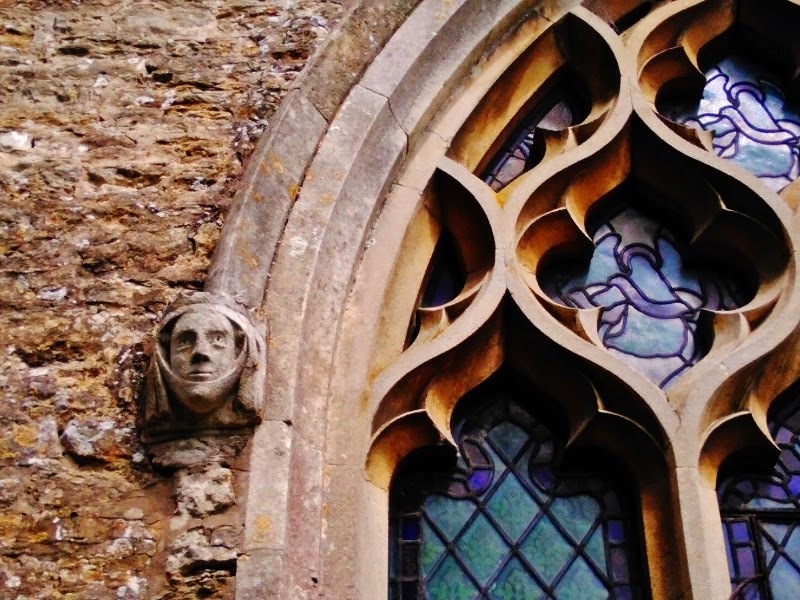 St. Mary's Church Gayton. Like so many churches now it is locked and has a notice posted indicating the roof is wired with an alarm to discourage metal theft and vandalism. Once upon a time...there was a door here which has since been bricked up. In the churchyard wall another bricked up doorway. 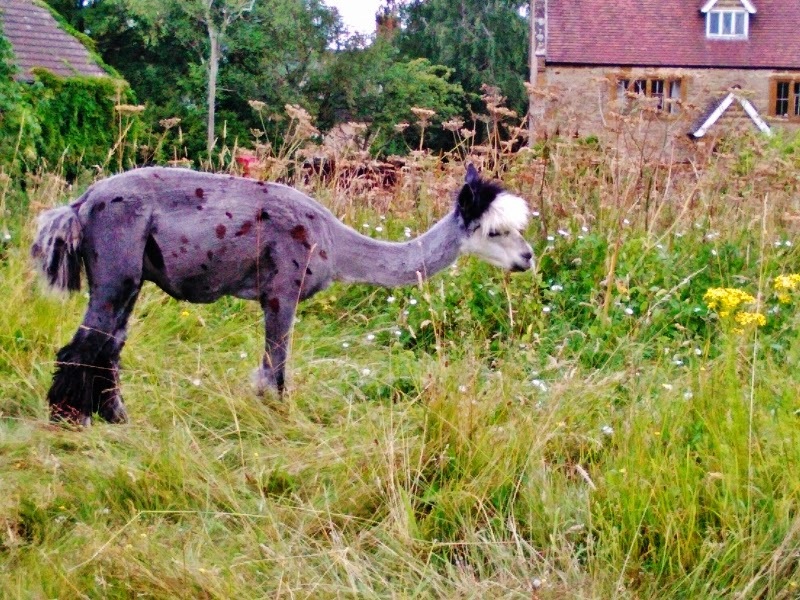 Who was she I wonder...and how long has she gazed upon Gayton? Before we set off again Les informed me that every churchyard had a spigot (water tap) and he found one conveniently nearby with which he refilled our water bottle and off we went to find the High Street. 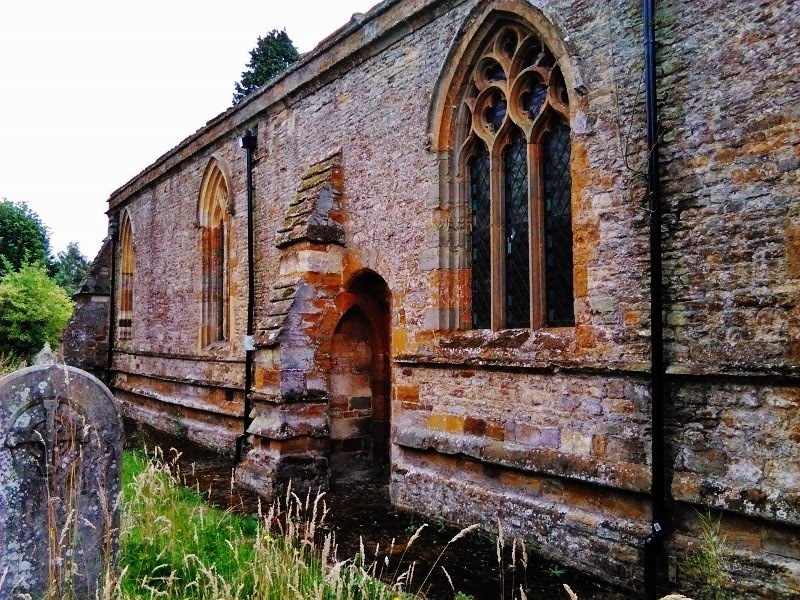 Gayton is a small village of 510 inhabitants (slow in growth, as it only had a population of 427 one hundred years earlier). Looking down an alley at the back gardens. Remove the blue plastic buckets, the rubbish bins and the yard lights and one might be in the 15th century. 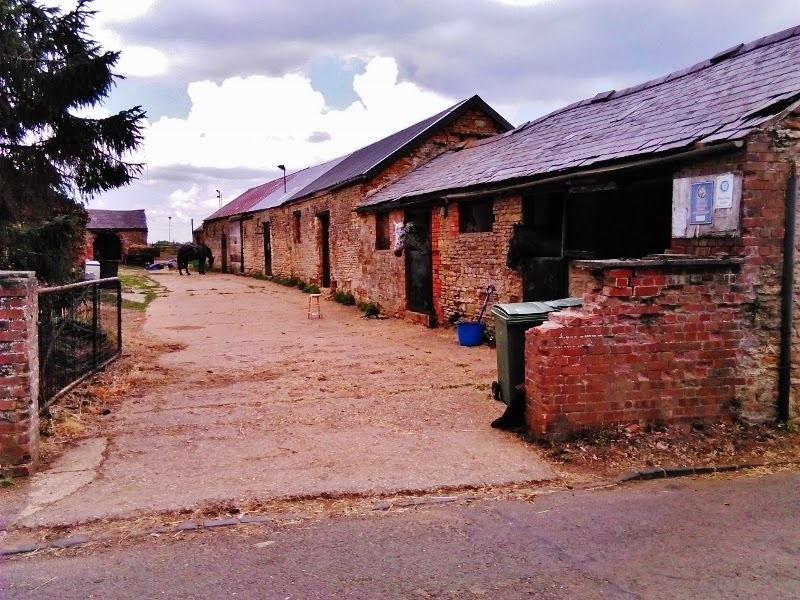 This stable is located in the heart of the village. We followed the meandering lanes overlooking the valley, enjoying the scenic view as well as the old homes and farms in the village. I plucked a Beech nut from an overloaded tree to check on the ripeness of the nuts. 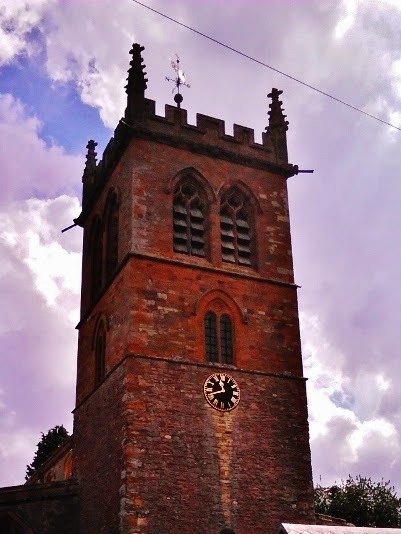 Eventually we made our way back around and stood on the kitty corner (or opposite corner) from the church. 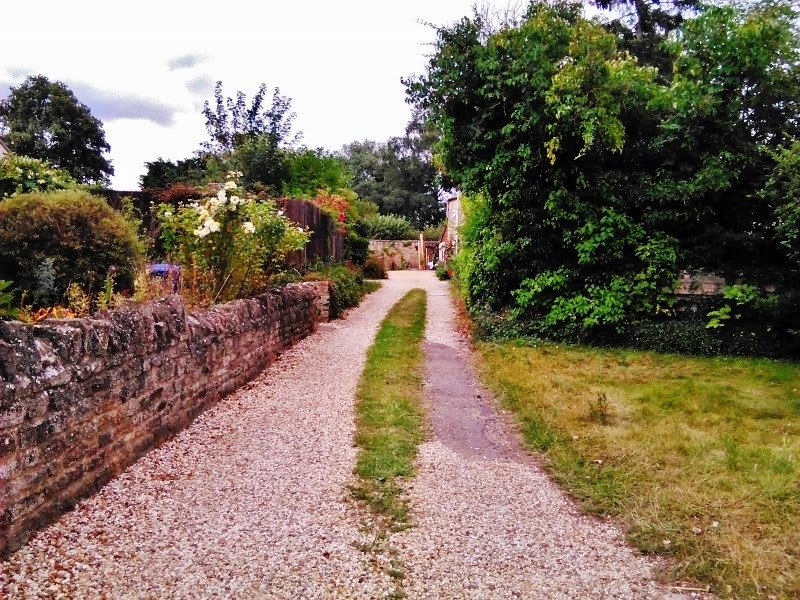 We were on the sidewalk in front of the ancient Gayton Manor--once a grand manor house dating back to the reign of Henry II (d. 1189)--now a farm with stone walls hugging the perimeter. As I stood in the shade of overhanging trees I looked up as short people often do and lo and behold glistening globes of ripe purple hung just out of my reach! Les brought the branches down to my height and we plucked a few ripe plums. Just further on were two more large trees with branches overhanging the manor's stone wall. Cherry plums and large green plums respectively fell into my hands. It was then Les told me with a wicked grin that I was "scrumping!" I beg your pardon??? I thought Les was suggesting I was engaged in some louche and unsavory behavior of a sexual nature when my Best Beloved informed me it means stealing the fruits from someone else's trees, which could--on the face of it--also be a metaphor for louche and unsavory behavior of a sexual nature. Hmmph!! I had never heard of the word scrumping and a check in the American Miriam-Webster's Dictionary indicated it wasn't even a word in American English, however the Oxford Unabridged English Dictionary did indeed include it and underscored that scrumping was less a crime than stealing in general but still frowned upon. Well!!! 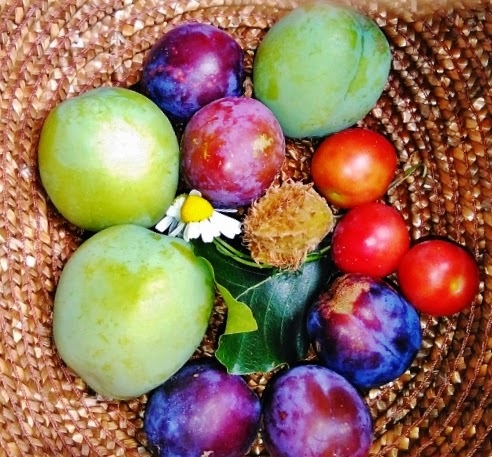 large unripe plums, purple plums, cherry plums, a hairy beech nut in its husk and a couple of chamomile flowers. Well indeed and where I come from any food hanging outside a person's lawful yard is fair game. As an herbalist I have spent many happy hours foraging in the woods, ditches and old homesteads of Eastern Washington for medicinal herbs and wild food sources. I also availed myself of windfalls from the yards of folks who grew fruit but never picked and used it. I figure what the manor doesn't know won't hurt them. As we walked back down the hilly lane to the boat I discovered a small patch of Chamomile! All in all it was a lovely day--a bit of history, some foraging about, and scenic views which took our breath away. I also took the opportunity to try a new technique or walking, based on the running techniques in the book above, and for the first time since I broke my foot in December 2011 it did not hurt me after a mile of walking! I don't know if I will ever become one of the Running People, but I am hopeful I can engage in walking for exercise again without suffering pain and swelling which makes it a miserable chore instead of the freedom and fun of moving. I've got 60 pounds to lose so I am feeling very motivated. 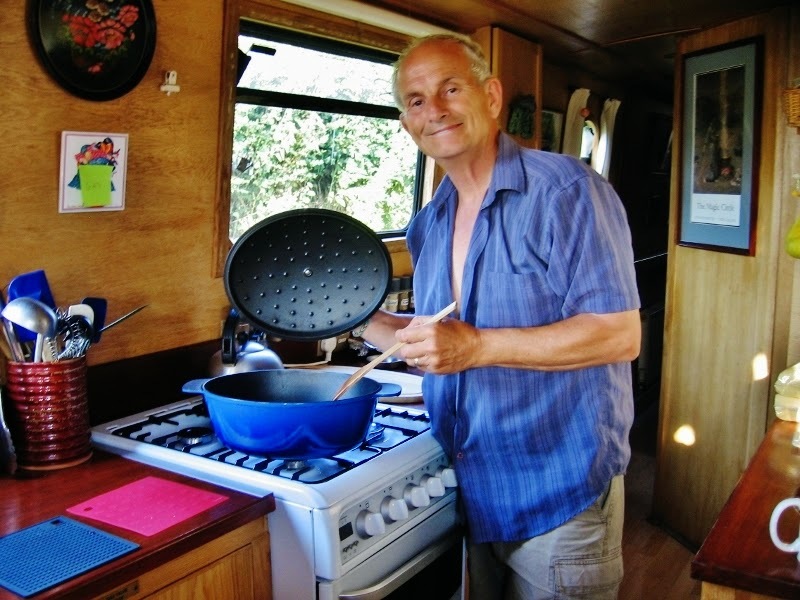 As we sat on the veranda (as I call the bow) eating sandwiches made from fresh baked bread, Les noticed a hole in the ground under the oak tree which had many, many insects buzzing in and out. 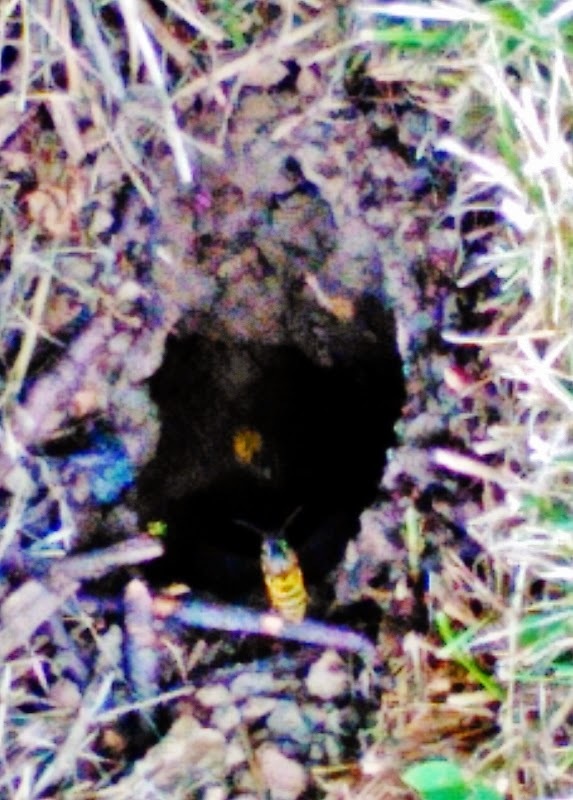 Closer inspection indicated a bee's nest. They buzzed harmlessly around Les as he squatted nearby to film their coming and going. My guess is a species of non-stinging bee. The next morning we were watching the horses at pasture when Les spotted a young fox take a rabbit in a field across from our present mooring. Of course a clutch of Magpies showed up uninvited for breakfast so the fox took its kill back to its den. Les was tickled pink and I was excited by his pleasure in discovering nature. Entering the former railway town of Wolverton it was nice to see the train mural still graffiti free after it`s refurbishment. Just a half minute of video showing part of the mural. 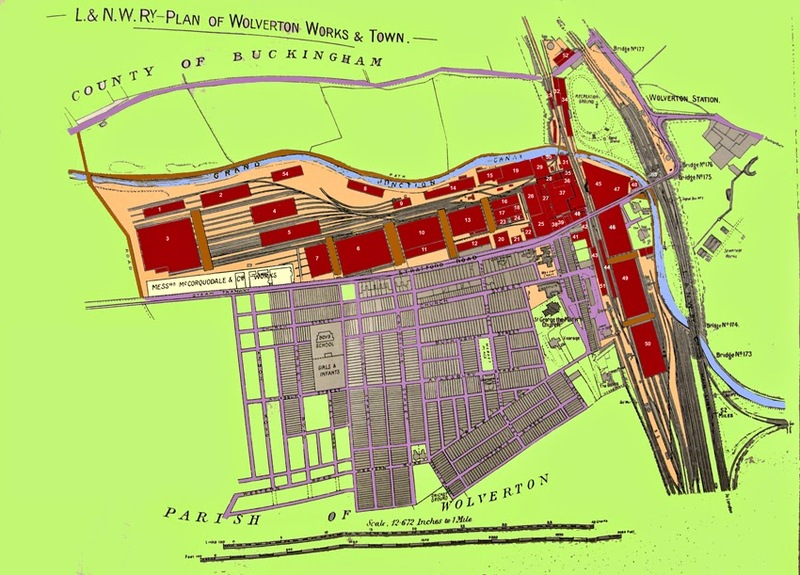 Wolverton was the largest carriage works in the UK. Up until 1863 it produced steam locomotives but this was transferred to Crewe works and Wolverton became the centre of carriage production and maintenance. The site was huge and parts of the town was built by the railway company. In the video the wall enclosed the paint shop. Tesco has built over a large part of the site and a lot of the buildings have been converted into commercial use and residential. 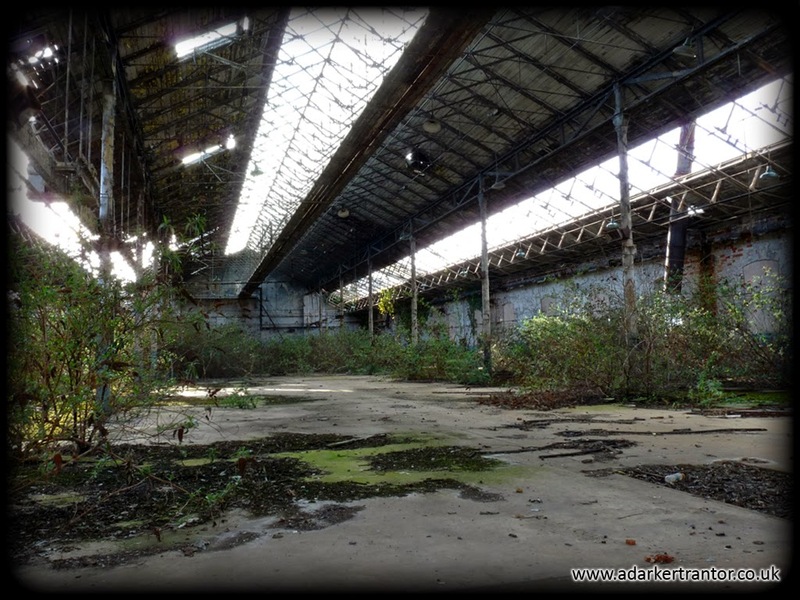 The Royal Train shed has been preserved and is now residential. 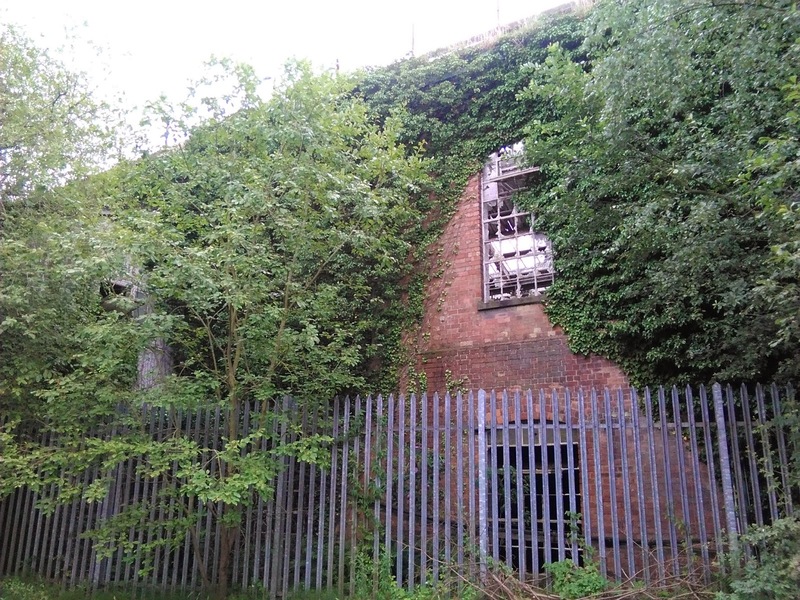 Just a small part of the site is still used for railway maintenance. On the left the paint, sewing and trimming shops of the old works are now commercial units within the original walls. On the right brand new housing on what was mostly the works recreation ground but there were some workshops as well. From this site. Thousands were employed in these works. Now the contracts go to non UK companies although at least these will be built here. More views of inside the works HERE. 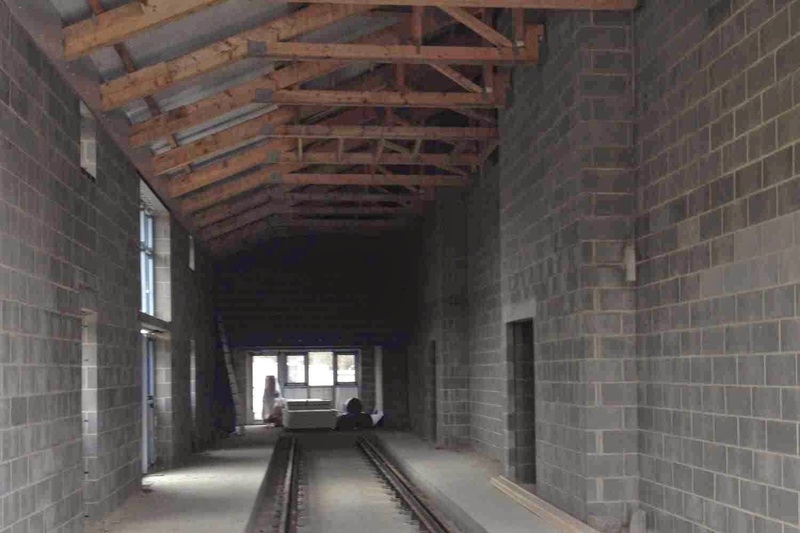 In time these remaining carriage sheds will also see a new lease of life and the cruise through Wolverton will be easier on the eye. 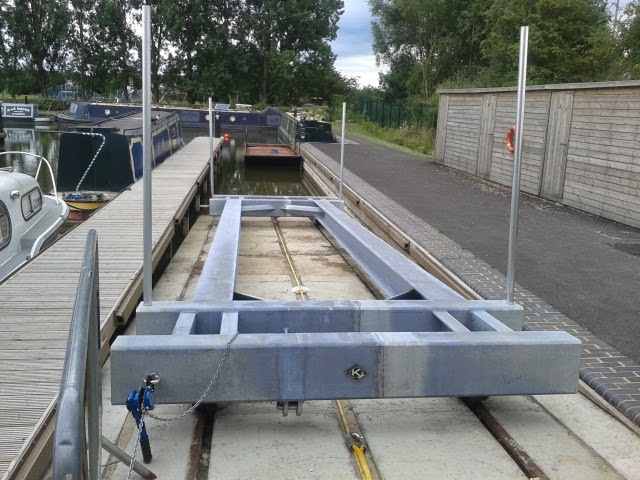 Approaching Cosgrove and the end of 12 lock free miles. 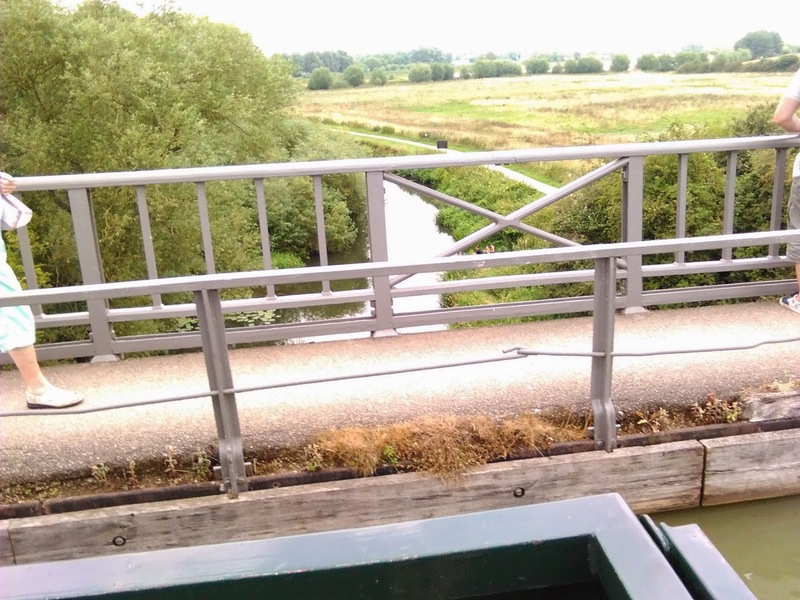 Into Cosgrove over the Cast Iron trough built in 1811 to replace eight locks that crossed the valley and the Great Ouse river. Just the edge of the trough on this side. and it`s a long drop. The canal crossed the river just to the right before it was diverted. It must have been hairy when the river was in flood. Just a narrow towpath this side. Native American Indian Camp alongside canal. Stay in a Wigwam the sign reads. Any one cruising the Grand Union through Slapton might think these canal side Wigwams are not quite the real thing. 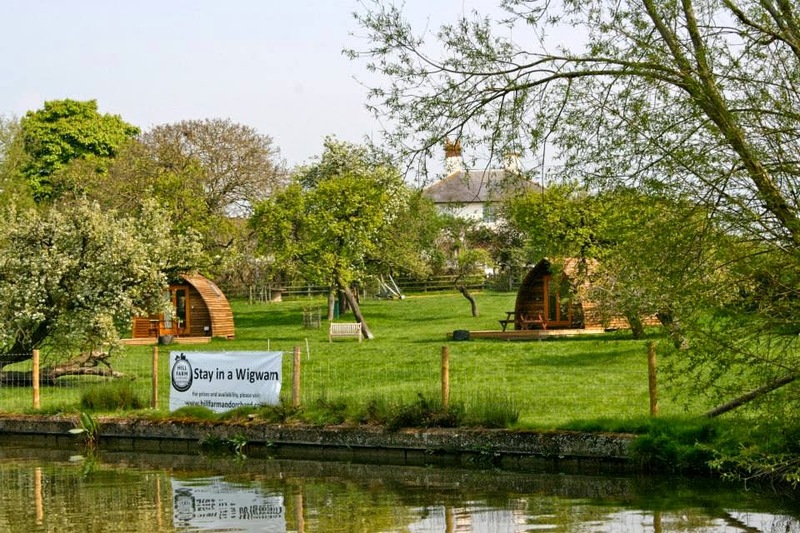 Call them what you will but these two are located on Hill Farm which is one of 60+ Wigwam Holidays franchised sites in the UK. Rates this time of year are £90 ($146) per night. This is a 4 berth, 1 double bed and a sofa bed. Facilities? Well you can run around the field. 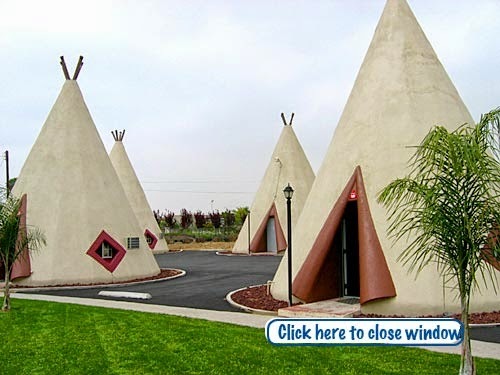 Now stateside in California on the historic Route 66 you can stay at the Wigwam Motel in proper.....ok they`re concrete but at least they look like Wigwams. Rates here are $88 (£54) per night in two double beds. Facilities? Not much need to worry about that having saved £40 per night but they have internet in each unit and a swimming pool. 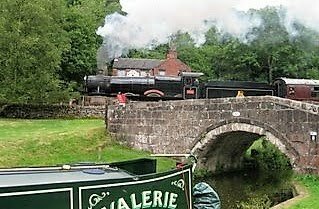 Ok i know the UK site has no internet but it has the bigger swimming pool, just watch out for the narrow boats. The new sunshade is handy when cruising, my poor Alaskan baby does not fair well in these hot sunny days. Yes it did fit under that bridge as it did under the old brick arches all the way through Milton Keynes. A first for Jaq, sharing a lock with a Fiberglass cruiser. I told her to keep a tight hold on our boat in case it drifted and squashed the Tupperware pot. Joking aside it`s just another boat and they were nice people. The view that night through the galley side hatch. 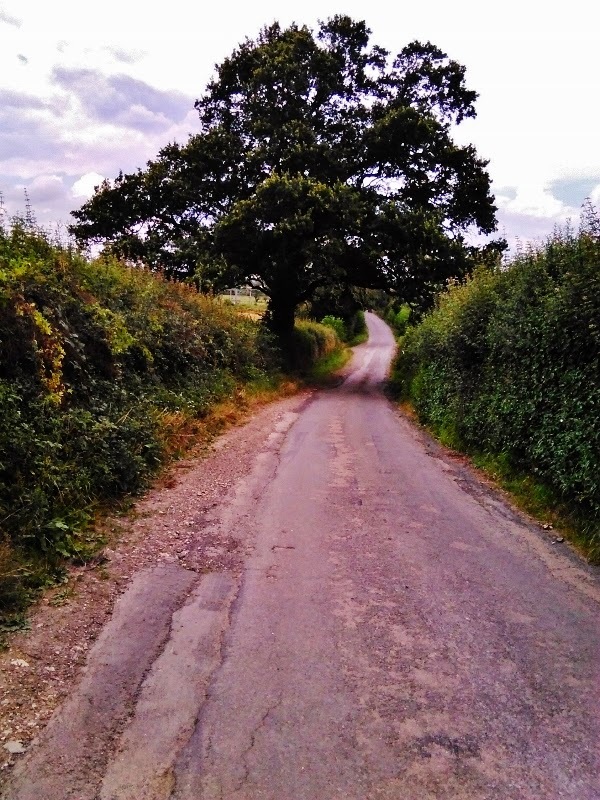 Just north of the Globe Inn at Linslade. It has come to my attention that recipes have to be tweaked for locale. An example of this is the difference in boiling water (or cooking eggs, potatoes, rice, or cakes) at high altitude versus low. It takes longer to bring fluids to a boil at higher altitudes. This is a wet dough. That is why kneading isn't necessary, except briefly before the second rise. I discovered the cup and a half of water was too wet over here in England, although it worked find in Pullman. My latest loaf made today with the change in water came out perfect. This is a small, round loaf with the best texture and lovely taste. Try it and let me know how you get on. How do you like the blog title? About 3 weeks ago my phone contract ended on what was my first smart phone the Samsung. Now my usage allowance included bonus loyalty minutes and just a very small data package as my use of apps for Facebook, games or anything other than incoming E Mail or a little bit of web browsing is almost zero. 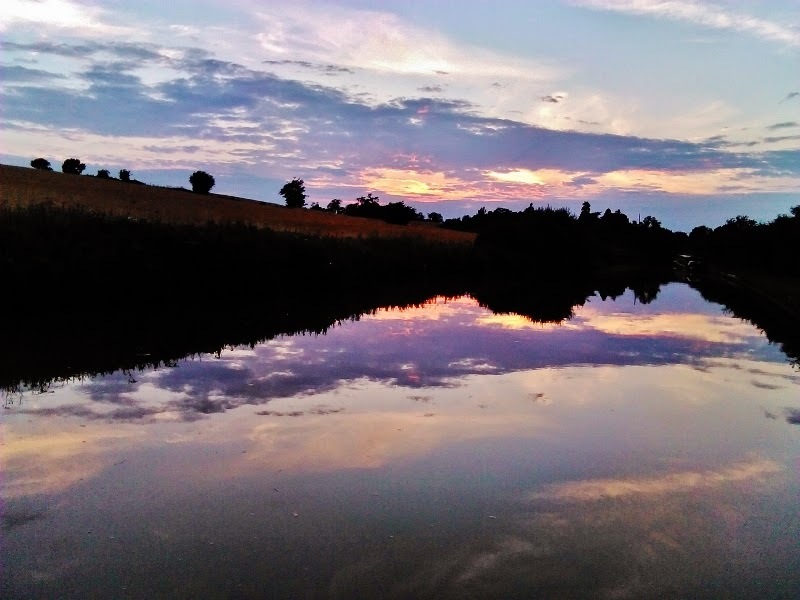 My last upgrade brought me into the smart phone world with a decent camera and wireless technology that enabled me to connect to the boats wi-fi. Most recent on the right. I did like the flip phones as I had a tendency to squash screens in my pocket against lock beams. Now I just buy a leather flip case. This time it was the attraction of upgrading from 3G to all the bells and whistles of 4G. The phone company EE, running Orange and T-Mobile, attempted on the phone to sell me a fancy expensive package. Jaq had picked up a catalogue in the high street branch of EE and it contained a 4G smart phone with more usage allowances than my so called loyalty package so this was my choice. Oh! plus it was 20% less per month. 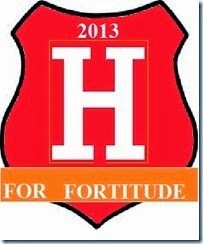 Morale is always check what they are offering to anyone on the high street and don`t bank on loyalty for the best deal. Less than 3 weeks later and our mobile Internet wi-fi contract ended and another decision to be made. Our contract with T-Mobile was for 5GB which we found to be inefficient as we both had laptops and Jaq also used hers for work. Some months ago we had trouble with being charged a lot when we went over our allowance. This I sorted out and had the charges squashed and the fair use policy re-instated. The last 3 months we have gone over the allowance but have not been cut off but just been restricted to not downloading films and music. Starting on the left the first two connected to the laptop. Then came two upgrades to mi-fi, wi-fi, horse fly, now we have the 4G all singing and dancing Osprey Internet. So this time we decided to pay a bit more and triple our allowance to 15GB and get the new 4G wi-fi box of tricks. The extra allowance will allow catching up on some missed TV via the net. We now have a much better phone/Internet deal for a very small, £1.42 ($2.30) monthly increase. I have been using Orange for about 20 years and T-Mobile perhaps 8years. 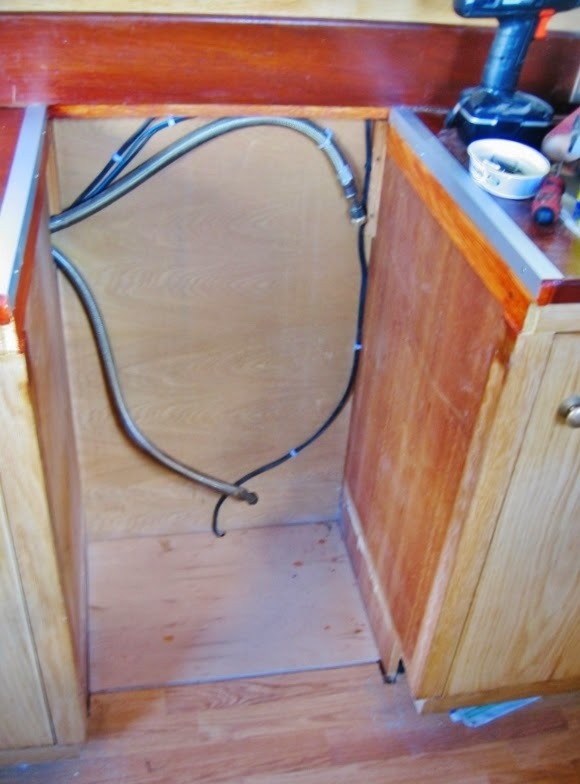 Important thing is they have been the two used on the boat since my beginning life afloat. 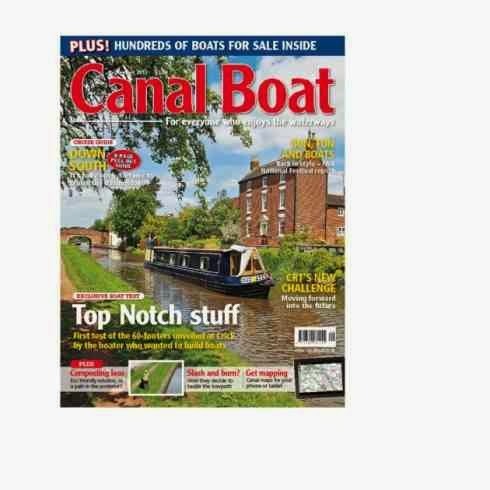 Coverage has been good with very few places nationwide on the canal system that the signal has been painful. Now the two company`s are one (EE) the extra masts might make even those painful times better. I did do some research with a view to changing the Internet provider and learnt about deals tethering, sim only and various other ways but decided to stick with that which I have proved works for us. The phone is a Kestrel 4G on the £13.99 ($22) package. The Internet is Osprey 4G+ on the 15GB £20 ($32) package. I remember well before 4G surfaced in the UK I saw it advertised in the U.S. Deals in the states will probably differ to here and if any U.S. readers want to share their deals, anonymously, with folk here please let me know and I will blog the figures. The deals I have listed include the phone and wi-fi equipment hence my collection of gadgets. Terrible throwaway society we have become. For the first time I am seeing 3G/3G+ on my phone signal. Is this a result of the introduction of 4G? 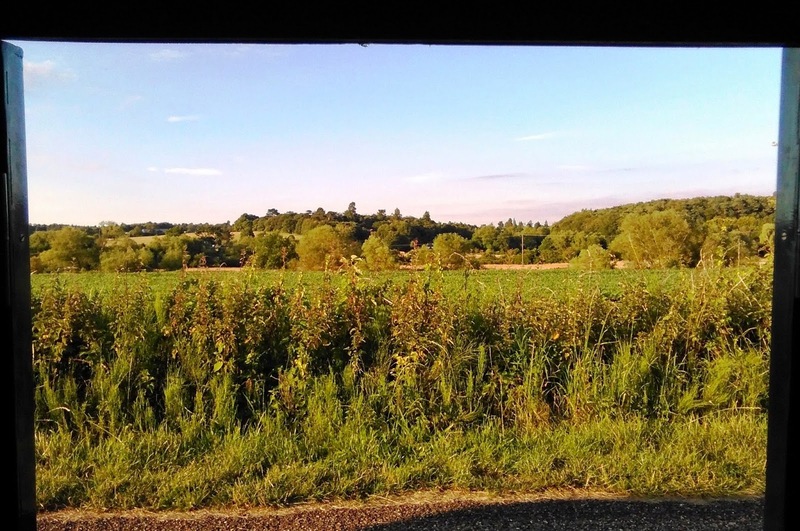 So to the last part of the blog title, the view from our current mooring. Please don`t complain you can`t see a Kestrel or Osprey in the picture. Every time Nb Valerie has passed this spot it has been taken. Above to the left and below to the right. Just a pity we have to move tomorrow as Mr. Tesco will be delivering to the boat and we need to get near a road. Just came across this in the picture folders. 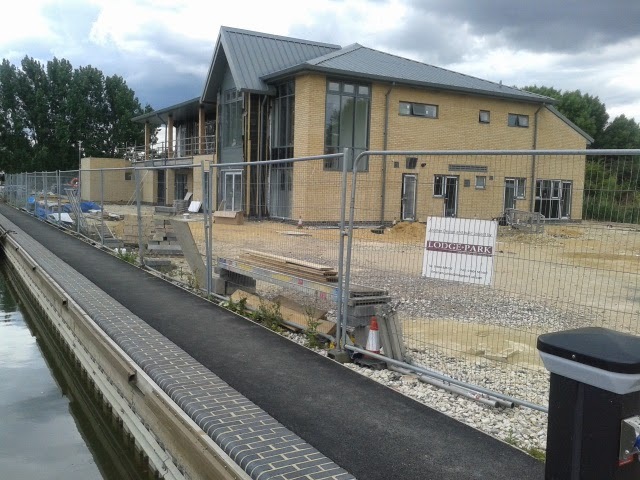 Remember the houses being put up at Marsworth the start of the Aylesbury arm. I commented on the metal framework looking like some industrial units. Well now the brickwork has started the style can be seen. The inner white blocks are within the frame and the dark brickwork forms the outer skin. 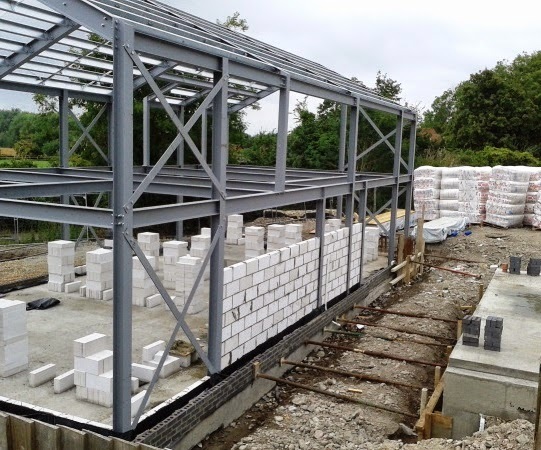 The gap will be filled by the insulation that can be seen at the back of the site. I wonder why this framework is used instead of the traditional brick built walls. 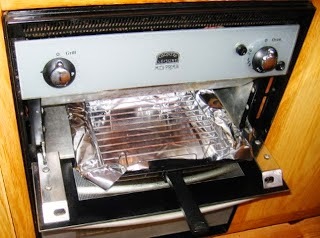 In response to Carol Palin's (WB Still Rockin) comment to my post about our cooker, below, I am posting several pictures of Dutch Ovens and the recipe I use for Artisan bread. 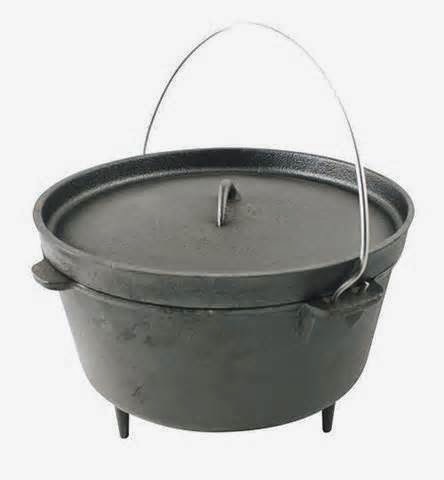 "Dutch oven" was originally a term for a large cast iron pot with three legs and and tight fitting lid with a deep rim and a large wire handle. They were designed for cooking on an open wood or coal fire. One put the ingredients inside, pulled the lid shut, tucked the pan down in the red hot coals and then placed six or eight red hot coals on the lid along the indented rim. This essentially provided heat like an oven. In the American West of the Cowboy era the cook in charge of the Chuck wagon on the cattle drives would have had a whole set of these in his Conestoga wagon. Click the link above to see how that was done. 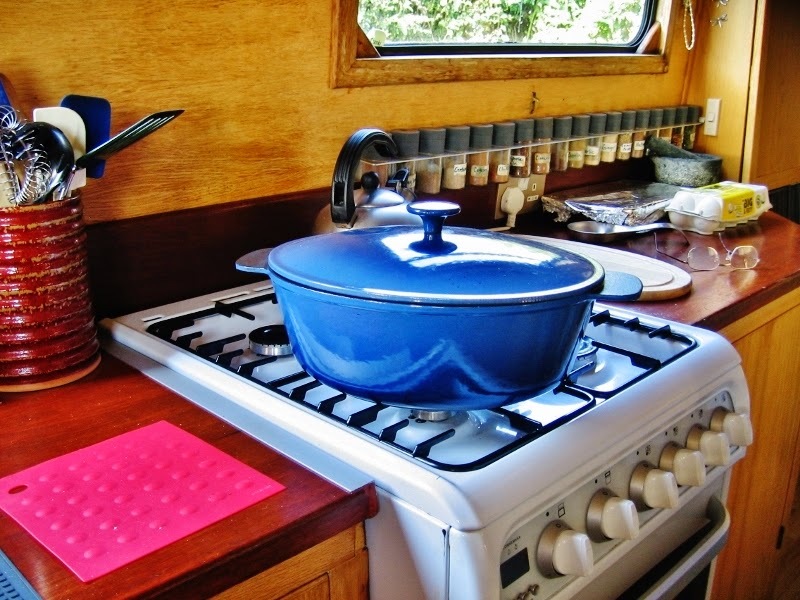 One can cook anything in an American Dutch Oven--stews, roasts, vegetables, biscuits, bread and even dessert! Now days this term is used for any cast iron enameled cook pot with a tight fitting lid. These pots can be very, very expensive. For example the British department store John Lewis sell the typical Le Creuset cast iron enameled Round Casserole large enough to bake this bread for £165.00. I purchased mine from Ikea for £40.00 three years ago. It is the large 5 quart cast iron enameled cooking pot which is a staple of their cookware. My model assisting in the photo shoot! My friend Chrisi Kincaid back in Pullman, Washington brought this Famous NY Times No knead bread recipe to my attention back in 2006. I've never been a fan of bread, using it mainly for the occasional piece of toast and a sandwich but that's it. Then I tried this bread recipe and I was hooked! 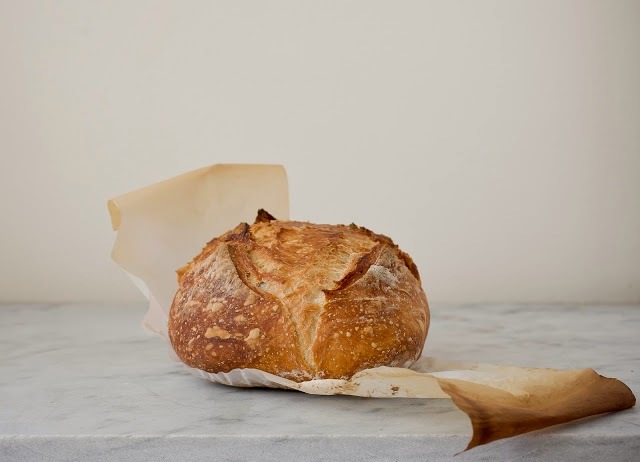 It comes out every time and the round boule has that artisan flavor and texture so beloved and so difficult for home bakers to achieve--browned crispy crust that shatters when you bit into it and a lovely, yeasty, chewy texture with air holes throughout. REAL bread! My Ikea cast iron enameled "dutch oven"
I usually sprinkle the top of my bread with a mixture of mustard, poppy, and sesame seeds, but over the years I've also mixed shredded cheese and diced green Chiles, various seeds, and three cheeses into my dough while prepping for the final rise (freshly shredded Parmesan, extra mature cheddar, and Asiago) and brought it to table warm and sliced to accompany a good meal. It makes excellent crostini and we like it for sandwiches too. It doesn't last long so I usually bake a loaf 2-3 times a week which is no hardship when bread is this easy to make and tastes this fabulous. My recipe differs from that of the original above in the link because I add 1 Tablespoon of dry active yeast to my flour. 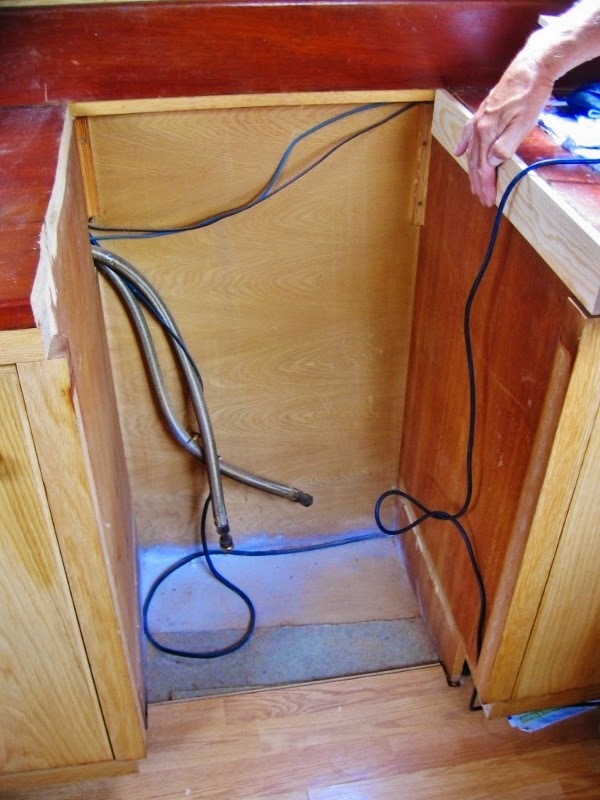 Otherwise it has trouble rising in a home (or boat) with varying temperatures. 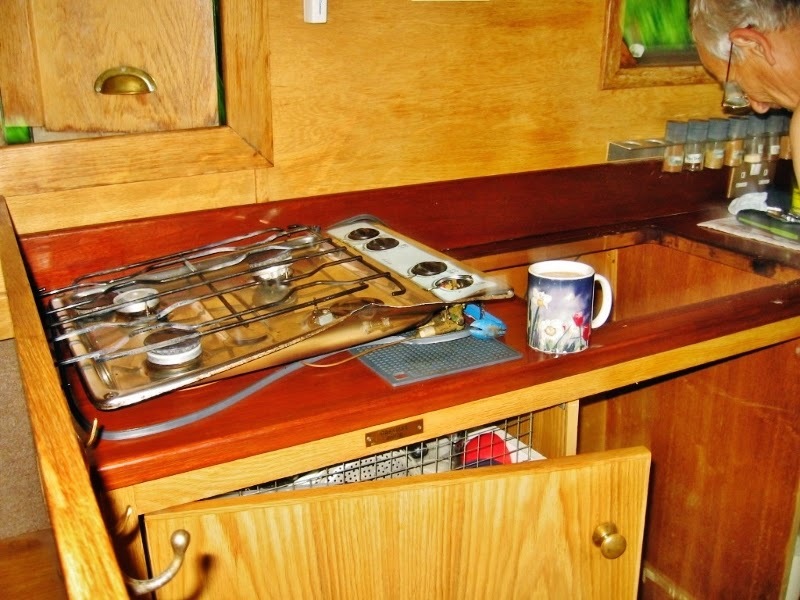 I also put my rising dough bowl on top of my fridge as that is one of the consistently warm places on our boat. I would even wrap the bowl in a towel if necessary to keep it warm. Mix dry ingredients with a spoon, add warm water and mix well until all the dry ingredients are wet and well incorporated. Cover and let rise minimum of 12 hours-maximum of 18 hours. Plastic shower hats work great to cover bread dough. Scoop out dough onto well floured counter top and give it about five to eight gentle kneads. Now is the time to add any extras like seeds, raisins, spices, cheese, Chiles, etc. Shape into a round boule or ball, and set it on a large sheet of baking or parchment paper and cover with a dish towel. Let rise for 30 minutes. While the dough is rising put your dutch oven with the lid on, in your oven and preheat both oven and pan together to thirty minutes at 450F or gas mark 7. When the 30 minutes is up carefully pull your very hot pot from the oven, remove the lid. Take the dish towel off your risen bread dough, (wet the surface with a brush and sprinkle with seeds, cheese or salt now), score the top with a sharp knife and place the dough and the parchment paper in the hot dutch oven. This is why its good to use a large sheet of baking paper so you can grab it by the corners. Put the lid on (it doesn't matter if paper is sticking out as long as the lid is on tight) and place your pot back inside the oven. Bake for 30 minutes with the lid on and then remove the lid and let the bread finish baking for another 15-20 minutes. Remove the pan from the oven, remove the bread from the pan, peel the parchment paper away and allow the bread to cool on a wire rack. Slice bread into long slices about a in inch in width, and then slice each piece in half. Cut at least two long slices for each person (four half pieces). Butter one side of each piece. Either sprinkle garlic powder over each buttered slice or fresh minced garlic--depends on how garlicky you like it and how upscale you want it to taste. Sprinkle each buttered, seasoned slice with liberal amounts of grated Reggiano-Parmesano, Asiago, or Grana Padano cheese and place the slices under the broiler. Broil on high for about two minutes--long enough for the cheese to bubble and brown a bit. Serve hot or cold--either way its addictive and satisfying. Crostini is great with soups, stew, or gravy--anything needing a mopped up plate. It is also a wonderful way to use a bit of bread that is a few days old and beginning to dry out. After thirty six months of doing my best to produce alchemy in the itty-bitty boat stove aka the Barbie camper oven (or Suzy Homemaker oven for American women my age who remember them), and making do with a cook top that took fifteen minutes to boil a half kettle of water for tea and could never do justice to a stir fry, I am thrilled right down to my socks to say we have a new cooker (kitchen stove for our U.S. readers) and boy does it cook! In the Home Pride camper oven it took over two hours to bake a cake, which inevitably was overcooked on the outside and barely cooked in the middle. The recipes indicated an average cooking time of 32 minutes for two 9 inch round pans, up to 50 minutes for a 12 cup tube cake pan; the times reflecting the average in a typical kitchen range in a house. While taking much longer to bake anything in the old oven on board, it was so small I could only put one pan on the middle rack--the other one had to go on the bottom which was way too cool to cook anything all the way through, so every fifteen minutes I had to switch the pans from one shelf to another and also give them a half turn. Anyone who knows anything about baking knows that disturbing a cake while it is baking will kill the rise and the cake will fall. I never could produce a decent loaf of bread in the Home Pride oven either. Cooking casseroles in it meant doubling the time and escalloped potatoes never did cook in the middle of the baking dish--even after nearly three hours. If I had turned up the heat sufficiently to cook the middle--the sides would have been burned to a crisp. 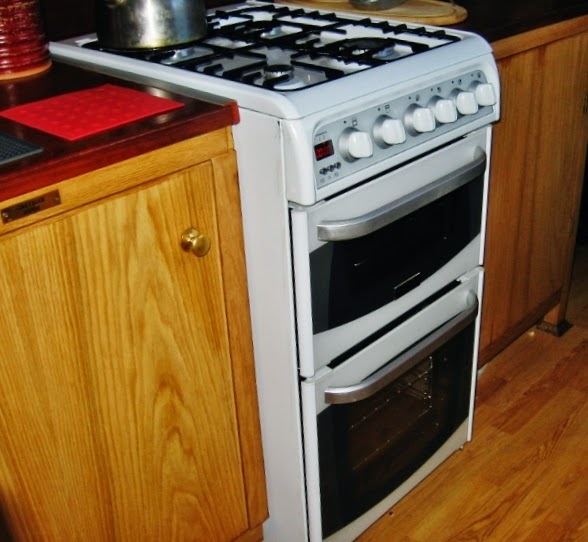 We took possession of our slightly used Cannon Connemara cooker last Thursday and by Saturday at 5 p.m. my lovely husband had stripped out the old oven and cook top, cut out the counter top, walked to B & Q no less than twice for bits and bobs, and had our new cooker installed. My Best Beloved lets no moss grow on him--or any projects which need doing, bless him! padding out the sides and adding the anodized aluminum edge. Les opened this space with a jig saw and a crow bar. 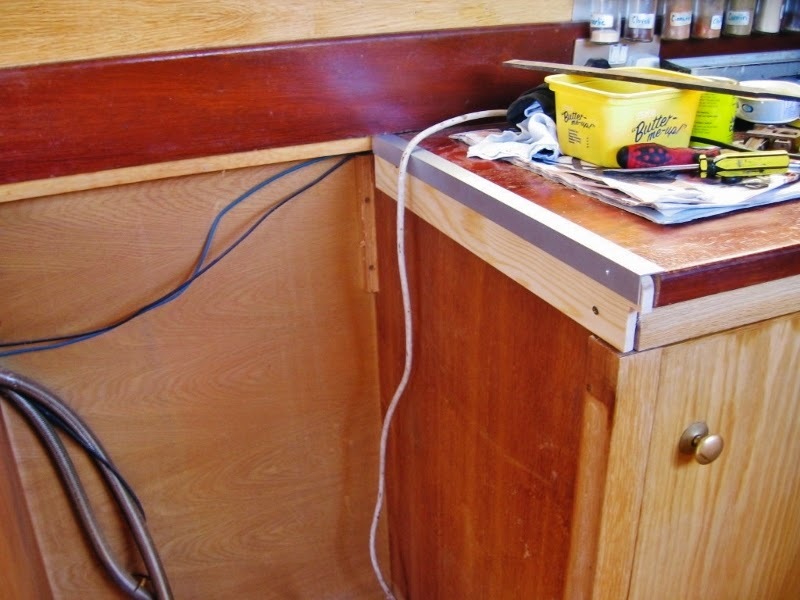 Sides straight, cables and pipes pinned and the space is clean and ready..
Voila! Our new cooker fits like a glove. Water boils in five minutes, stir fries come out perfect--the meat is crisp and browned quickly and tender inside, the veg are browned on the surface and crisp to the bite and the sauce comes together 45 second after adding to the pan. Now it was time to test the oven and grill. 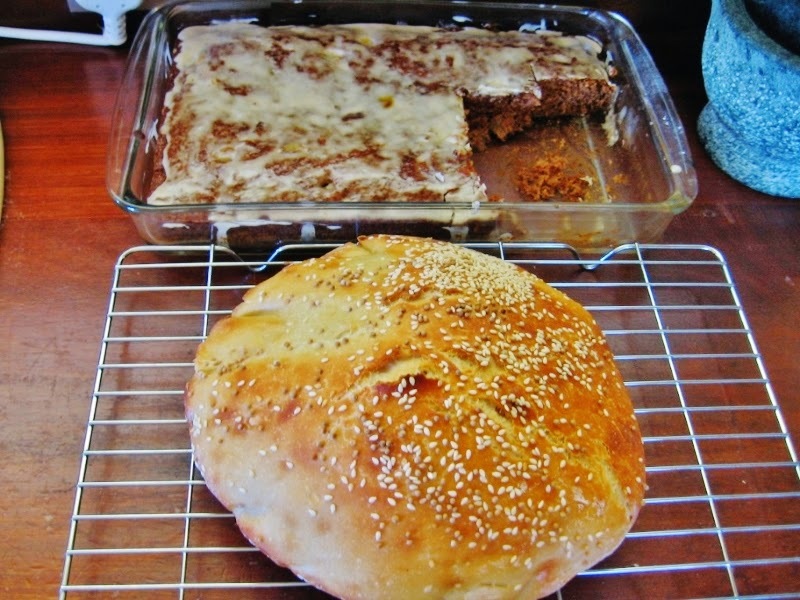 Glazed Applesauce cake and freshly baked artisan bread! I baked an Applesauce cake and it took exactly 40 minutes to cook, rising to a lovely browned, tender crumb, evenly cooked sides, ends, and middle. Perfect! Potatoes Au Gratin came out of the oven cooked all the way through with a lovely browned crust after 50 minutes and pork chops cooked in the grill to perfection as did crostini. I dug out my glass covered bowl which I used to use to raise bread dough, and mixed together 3 cups of flour, a sachet of yeast, one tsp. of salt and one and 5/8ths cups of water, covered the bowl and went to bed. Twelve hours later I slid the dough from the bowl, kneaded it about five times, shaped it into a round, l slid my cast iron enameled dutch oven with lid into my new oven on the second shelf, closed the door and pre-heated it to 450 F (Gas mark 7) while the dough rose again. After 30 minutes I slid the round dough on the baking paper into the smoking hot dutch oven, slapped on the lid and slid it back in the oven to cook for 45 minutes. Out came a lovely round loaf of delicious bread just like I used to bake at Cloudhouse. The browned crust cracked as it cooled. The interior crumb was yeasty and chewy with the lovely air holes I like. At last--I can finally cook and enjoy it once more instead of feeling like I am camping out and making do. There is lovin' in that there oven! Thank you Les. 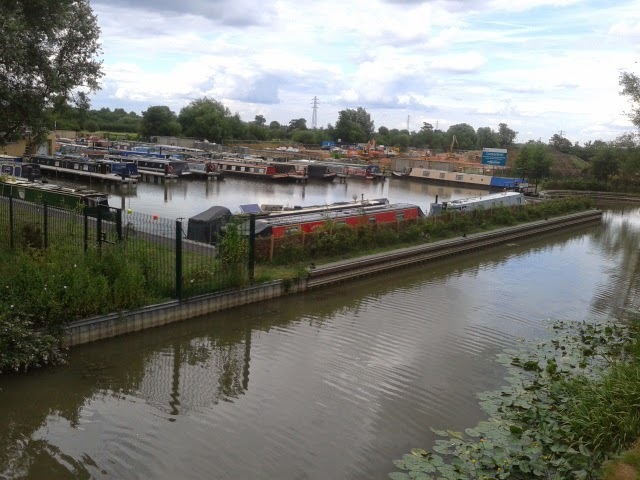 The cruise into Aylesbury basin from Marsworth is 16.25 miles but our destination was the Aylesbury Canal Society marina at Circus Field 0.7 miles before the basin. 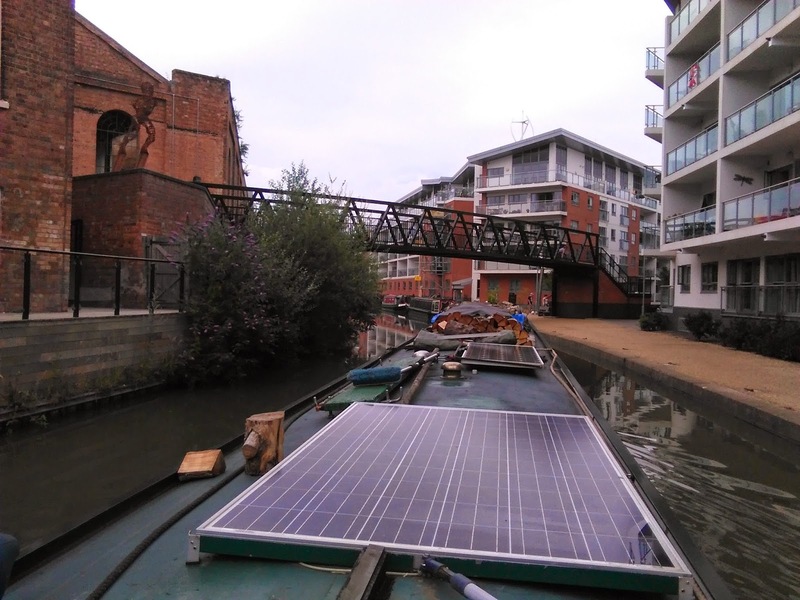 The ACS were originally located in the town centre canal basin where they had a lease until 2018. Back in the days of British Waterways Aylesbury council who had a £4.3 ($6) million grant from the department for communities and local government to develop the canal basin area. In 2007 B.W. 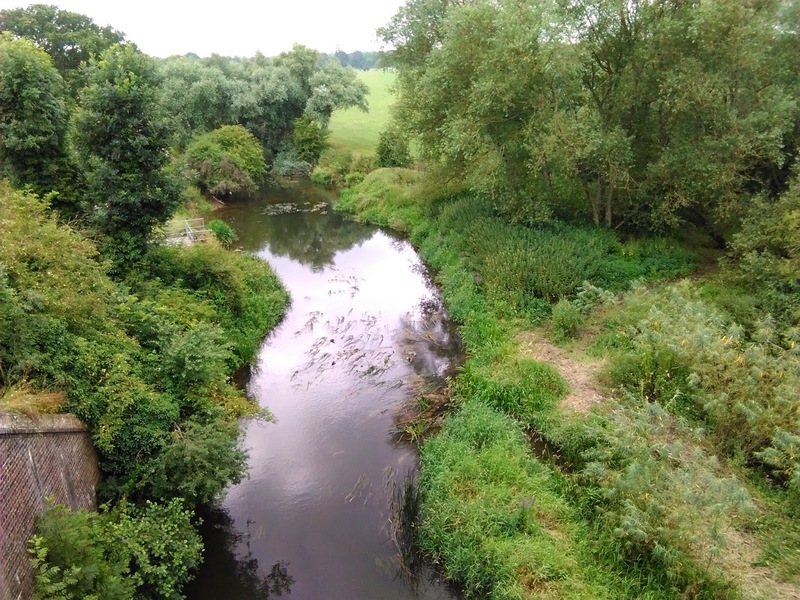 sold the basin to Aylesbury council on a 200 year lease and for much of the time since negotiations have been ongoing. In 2010 planning approval for the marina was granted, bet that was the fastest on record, and the council stated the cost to be £2 million. Now all the `who pays what` is not very public but I did hear the ACS got £2.5 million for their lease. The 2010 figure must have increased so the small amount I heard ACS had to find sounds about right. Now by coincidence, if you believe in such a thing, immediately next to the marina the council released some more land for a housing development of 74 homes. My thinking is this might be the income to pay for the marina development. 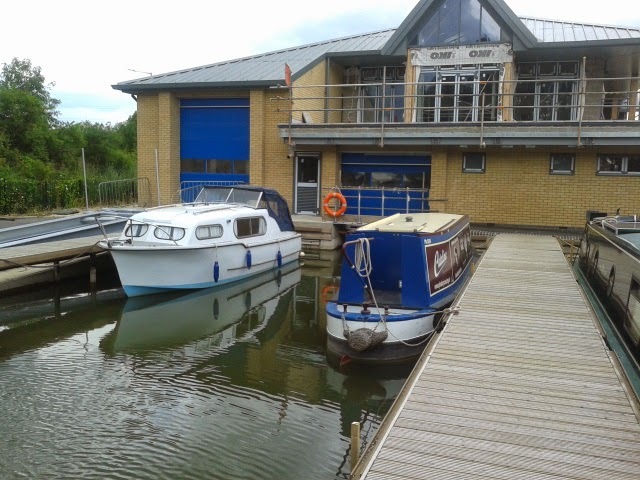 Anyway forgetting all the rumors and theories the Aylesbury Canal Society now have a 40 berth marina with a clubhouse with a hall on the first floor for hire. Also within the building are wet and dry docks. The ACS welcome boats to stay free for up to 14 days. Electric hookups are available using £1 cards. Also there are washing and drying machines at very reasonable prices. Just moor by the bridge and look for the boat with the rooftop `welcome` sign and Bryan will give you a big warm welcome. Jaq raises the bridge to let Nb Valerie into her temporary home. View from bridge. Nb Valerie is the 3rd boat from the left. The new housing can be seen to the side of the marina. Dry dock is the blue door to the left and wet dock on the right. 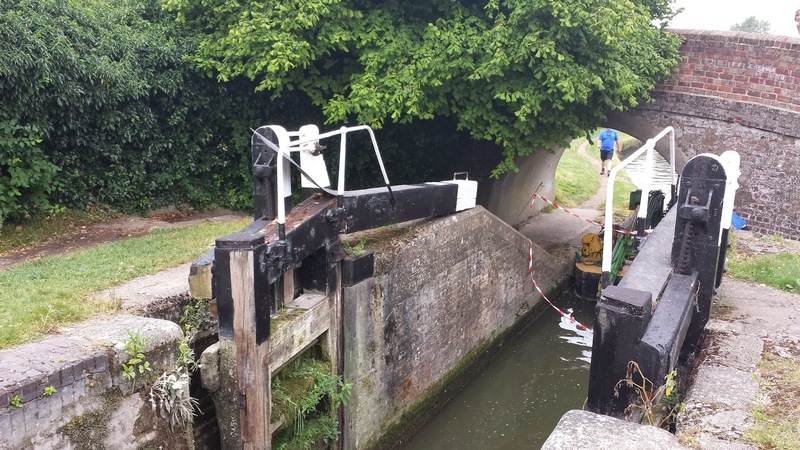 For boaters wondering about the latest stoppage on the Aylesbury arm this photo by our friend Robert on WB Wind in Willow shows the beam at lock 2 within the staircase snapped and resting on the lock side wall. Summer Time and the Livin' is Easy..